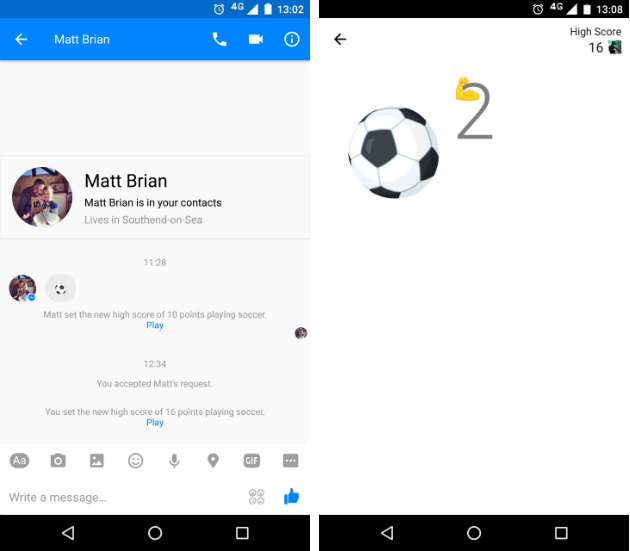 How to play Football in Facebook Messenger? Looks like the Facebook is serious about keeping you around its Facebook Messenger app. The company has launched a Football game in its Facebook Messenger app. Games such as Chess and Basketball were introduced earlier and the messenger users around the globe are addicted to them with the Basketball game in particular. Here in this post, we are going to guide you on how to play Football in Facebook Messenger. Update your Facebook Messenger app to the latest version. Open a chat (single or group chat) with whom you want to play soccer. Tap the emoji icon and send the Football Emoji. Boom. The Football game is now available to you. In the chat thread, just like the basketball game, the app will keep track of the high scores among everyone. If this feature is still not available to you, kindly be patient and update your Facebook Messenger to the latest version. Let us know your views on the hidden soccer game in the Facebook Messenger. We would love to hear about your experience in the comments section. You might also like: How to play chess in Facebook Messenger?